One month ago, 14 students and 6 adults from our church returned from an incredible mission trip to the earthquake-ravaged and poverty-stricken country of Haiti. 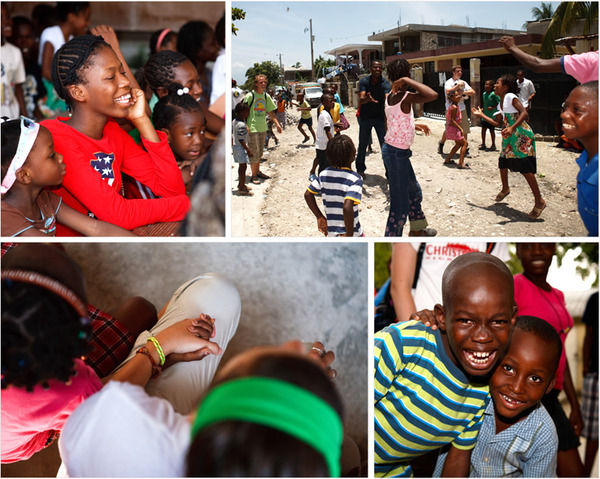 (If you missed my post in July, read up there on why we chose Haiti.) Chad and I were both among the group, and I can tell you that it was the best, most meaningful and powerful week of my entire life. He'll tell you the same. Since we've been back, there have been so many times I have wanted to write this blog post, each time not knowing how to even begin. God revealed SO much to each of us during our one-week stay—experiences and emotions that can't be fully expressed in words or shown in photos. In fact, it's taken most of our group weeks to process through what we saw, heard, tasted, smelled, and felt first-hand (internally and externally). One thing is for certain: as it is written in Acts 4:20, "We cannot keep quiet about what we have seen and heard." I believe we experienced Haiti so that we could come back and be storytellers to our nation; to share encouragement and inspiration over what God is doing in Haiti, and what He did in, through, and around our group in our very short time there. So, buckle up… This entry, along with eight more to follow (yes, eight), are my attempt to share raw and emotional tidbits of our encounters in Haiti, as well as observations of American culture and lessons we learned. My prayer is that you don't read this as a journal of "what Chad and Amber did with a group in Haiti", but as a painted picture of what God is doing and how you can jump on board with His movement. May God soften, challenge and convict your heart as He did ours. On July 31 (after months of planning, fund-raising, prayer and preparations) we flew down to Port-au-Prince, Haiti to meet up with Adventures in Missions (AIM) and partner with a local church in Carrefour (6 miles west) to spread the Good News of Christ. Only, when we all got there, God was already moving like crazy! When we left Haiti on August 6, it was very clear that we were instead ministered to all week, meeting people who were truly alive in Christ, seeing what it meant to [really] love your neighbor, and what it actually looked like to have total dependence on God. The cities were beautiful—yes, they may have been covered with rubble, garbage and dirty water, but they were painted with bright colors, and humming with laughter, activity and life. We walked everywhere we went, just as the Haitians do. We were always kindly greeted with a "Bonjou!" or "Bonswa! ", friendly, gleaming faces and waves. Children would often run to give us hugs as they melted you with their sweet smiles. They were incredibly hospitable people, inviting you into their homes/shelters to chat just for fun. It was not uncommon to hear singing (gospel choir style) at all hours of the day or night and passionate preaching bellowing from homes or areas of worship. Haitians like to dance, like to play soccer, like to cook, like to share their knowledge and skills with each other, and like to mingle with their communities. Morgan, one of our 15-year-old students said, "America is comfortable, but Haiti is alive." How profoundly true her observation was. There was so much hope in Haiti, despite their lack of material possessions, housing, food, and money. Most of the people we met had hardly anything at all—some shared flip-flops or sleeping mats with each other on a rotation. It's been more than a year and a half since the huge earthquake rocked their country, but there are still more than 630,000 people in and around Port-au-Prince still living in tents/tarps (displacement camps). Even still, the Haitian people are so vibrant; so resilient; so full of joy and of God's love. I am truly humbled to have been encouraged by meeting them. Chad and I very much look forward to going back someday. Read the next response (#2 of 9).